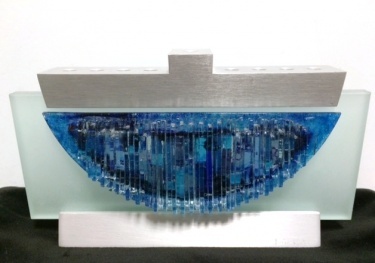 This frosted glass Menorah was designed by K4 Glassart, also know as Kelemen Kuatro. Fused textured glass in different shades of blue shaped as a half moon over frosted glass. Aluminum base and top to hold candles. Signed on base. Measures 10"L x 6"H x 1.5"D.
Using kiln-formed contemporary abstract glass art using Bullseye and Enamel-Type techniques. K4 GLASSART develops different designs, techniques, and materials to bring out the desired optic effects, forms, textures, transparencies, and a wide array of structures and colors.